If you have a story to submit - Please do!... Simply post it to the "Files" section of the NYCPRC Yahoo group - and say you did! Its bad enough that they can bond with me and often do but if I lose them, I lose friends and dont I want to make the heartbreak worse by remembering them by name. Yet, when I go down to check out the flock I take care of and see a bird that needs watching, I have to name it in order to fix it in my memory. 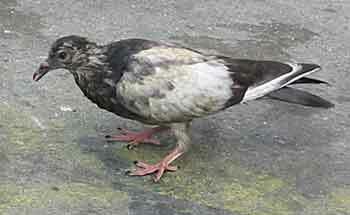 So many pigeons have the same coloration its difficult to pick one out of a flock that consists of over 100 birds. Therefore, I have to give the bird some designation, which is usually descriptive of what is wrong with it. 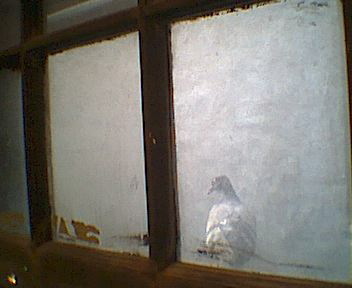 During the summer of 1999, while feeding the flock and watching for any bird that seemed to be in trouble, I saw Wedge. 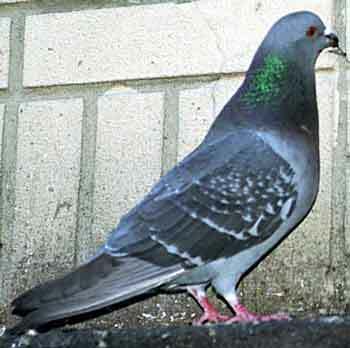 He was what is called a splay pigeon, a bird with black and white feathers. He had a remarkably beautiful face. That bird should not have been alive. He had experienced some sort of impact injury and had a vertical dent in the center of his forehead that ran from the base almost to the very top of his head. He must have gone into the corner of a column or building a car impact would probably not have caused an injury like that. I surmised he probably suffered the insult from a panic flight. The flying agility of pigeons is renown. How a pigeon can be so clumsy on the ground and become such a supremely graceful, agile bird in the air is beyond my comprehension but there it is. These birds can twist their bodies in midair in order to escape the vise-like grip of a predator. Wedge did not go into whatever he hit unless he was in a state of sheer panic. Whenever I went down to feed the flock, I always looked for Wedge to see how he was doing and the little guy did pretty well throughout that entire summer and fall. I simply didnt understand how he was making it and thought this to be one of those incredible miracles that happen with many permanently injured pigeons. They have such an amazing will to keep going and are real survivors. Wedge was one bird that proved it. Something happened towards late November. On a Saturday, while feeding the flock, Wedge was there but was walking and pecking very slowly. Here was a major behavioral change. There was no question about what was going on. That injury was doing more damage and Wedge was at the beginning of the dying process. That was when I walked over, picked him up and took him home. This wonderful fighter deserved the well-earned respect for his long fight and the dignity of not having to die alone, in the street. When I got him home, he was treated the same way as any other bird in need of help. Three anti-parasitic drugs went down his throat and an antibiotic was started just in case there was something wrong that was not immediately seen but I knew that his problems were not going to be solved with pills. He had absolutely no fear of me. He took to the cage as if he lived there all of his life. I was trying to help him and he knew it. These birds can sense who their friends are. After eating his first good meal he had known in who knows how long, Wedge took a good long drink of water and then calmly walked to the back of the cage, laid down on the toweling, closed his eyes and went to sleep for a few hours. This is not what a frightened bird does. There is a difference between a pigeon that is so sick, it doesnt really care where it is and a bird that knows it is safe. Wedge knew he was safe. Wedge and I kept each other company for a week and a half. He was very curious about his new home and made no bones about trying to get over to anything he wanted to explore which made it difficult keeping him near the cage. The cage toweling was changed twice a day. He received the antibiotic every twelve hours and I made sure he always had fresh water and a filled seed cup. He ate more than most other birds I had tendered to. Whenever I opened the cage door to do anything, he walked over and looked at me straight in the eyes. I knew what he wanted and gladly let him step onto my hand, took him out and gently held him. He wanted to be cradled but immediately took his head out of the way if I tried to touch it. It was then that I realized Wedge was in a lot of pain although he never showed it but he did want the love, affection and sense of security he seemed to think I could offer him. One day, when I came home from work, Wedge was sitting at the back of the cage and for the first time, he did not get up and walk over to the door when I opened it. However, he still looked at me with those now, obviously sad and tired eyes. I knew this was it, as did he so I gently lifted him up and out of the cage and put him on my lap. While I slowly stroked his body, he closed his eyes. His breathing slowed and after about twenty minutes, Wedge simply stopped being. My body hurts. Im so weak that I can hardly fly anymore. My legs are barely holding me up but I will try to remain standing because that is our way. We stand until we can no longer stand. My head feels so peculiar. There is dizziness and my body feels so hot. Im so thirsty but Im too weak to look for any water. There has been no food in days. I cant compete with the others because they get to the food first and there is nothing left for me when I finally reach where the food was. I must preen my feathers to keep them clean and ready to fly but I just cant do it very well. I pretend to clean them so the others wont suspect how I feel. Yesterday, there was a hawk hovering above us. The others flew together but I felt too ill so I sat on the terrace. The hawk either did not see me or he was too afraid to come so near to the building so I was safe. This morning I was sitting on a terrace and trying so hard not to show the others how sick I felt. If they knew, they would attack and chase me away. This mask just drained more strength from me. My mate was standing next to me. She suspected that something was wrong, that something was different with me. She leaned over and nuzzled my neck but I couldnt respond. All my eyes wanted to do was close. What is the matter? What happened to me? Im dying. I didnt know it before but now Im sure of it. I can barely walk but I have to find shelter. There is no place to hide here so Ill huddle against the side of the building. Maybe, humans, rats, or cats will not find me. They can all hurt me and I fear them. I have to live. I want to be back with my mate. I will lean against the side of this building and rest a bit. Perhaps I will feel strong enough to fly back up. Im starting to shake and gasp. Breathing is not easy now. My eyes want to close. I feel so sick. Ill close them for a while. People are walking past me. They do not stop but some look at me as they go about their business. Death is now close. I dont care about anything anymore. Let it come. What a lousy day at work! Nothing went well without a hitch. I couldnt get anything done. Im glad to be getting home and maybe I can get more accomplished tomorrow. Some days are just like that. Impasse Day, thats what it was. Ill call my boss tonight and maybe we can figure out how to get through all these roadblocks. Heres my bus stop and I am off and walking home. No pigeons are down. There must be a hawk in the area. This time of year is murder on the pigeons. The crows used to warn them if there were any predators in the air but since West Nile virus decimated those birds, the pigeons are more nervous. They have to rely on themselves more. I dont see any sick or injured on the ground. So far, so good. All the way home, I am looking for any pigeons hiding under cars, in storefronts, standing alone on the grass but nothing is doing. The hawks get these birds this time of year before I can get to them. They are entitled to live too but I feel so badly for the pigeons. Im walking up the hill to the building. Nope, I dont see anything down in this flock either. I hope I dont find anything down because Im not in the mood for it. I just want to get upstairs, take a shower, put up some coffee and watch the news on TV. Before I do any of that, Ill go upstairs and take care of the one bird I have. Hes one lucky bird. Last Saturday, I was down feeding the flock and noticed this little guy eating and there was seed falling out of his mouth. That had to be canker. This bird had an obstructed throat. I picked him up and sure enough, looking in his mouth, there was the foreign tissue partially blocking his throat. I got him just in time before he started to really go downhill. The canker is falling apart already so Ill just hold him until it is all gone and the lesion in his mouth is healed up. That bird hates me. Hes trapped in a cage and hasnt the foggiest idea of what Im doing for him. At least show some gratitude? Im up the hill and turning into the building when I see this pigeon. His eyes are closed and hes literally leaning against the side of the building. He doesnt even see me as I step over the fence and head for him from behind. Wait, his eyes just opened and he sees me. Hes starting to flap in order to fly away from me. Hes too weak to move fast. I have him. So whats going on with you? Theres no food in the crop. Hes running on empty. Theres no Canker in the mouth, no breaks, no infections or injuries on the skin. The vent looks clean. There is no nasal discharge and the eyes look clear but you can see how sick hes feeling in those eyes. Is this starvation or illness or both? Who knows? Ill find out more when I see droppings. His heads not twisting so I dont think it is Paramyxo virus. He has that and its all over. This little guy is really thin and weak. That keel bone is really prominent. I hope its not a chronic illness. They just dont recover from those. Its just too early to know anything. God, I hope its not that wasting disease that doesnt even have a name. They lose all their body fat and nobody has it pinned down as to what that is. If that didnt show up in the pigeons periodically, I would guess that it is a metabolic imbalance of some sort. Ok, what to do? Ill set up a water cup and a put some seed in another cup and toweling in a cage. First, Ill put his head into the water cup and let him drink. He has got to be dehydrated. He gets an antibiotic first. Ill play it safe and put down a med for Canker and Coccidiosis. Hes too weak for me to worm him. If he lives, Ill do that when he feels a little better. Thats done. Now, down goes some soaked dog food. I wont give him much. I ll see if he can handle any food. This bird is so weak he can hardly stand. It doesnt look too good for him right now. Who knows if he will last even for a few more hours? His body may not even give the meds, water and food a chance to work. Ive done everything I can for him now. He goes into the cage and Ill leave him alone for now. Later, hell get some more water and that will be it. Ill just check for droppings. It doesnt look like there will be many later, if any. The first system that shuts down just before death is the digestive system so lets hope that there will be some droppings. Im drifting in and out of reality now. Sometimes, I dont remember dreaming at all. There is nothing. Then I snap back into this terrible sick feeling. My eyes are now open and I see a shadow. There is something coming up from behind me. Before I even have a chance to look, I feel being grabbed. I have to get away. I try to fly but its no good. Im too weak. I am grabbed up. What is the Man doing? He opens up my mouth and looks in. He is feeling my body all over, looking among my feathers. Why? I am so scared but am too weak to fight him. Please let me die in peace. Dont hurt me. Cant you see how sick I am? He is taking me inside the building. He will hurt me. I am so frightened of him but there is nothing I can do. There is water right in front of me. I am so thirsty that I dont care about anything else right now. It is good to drink. He is opening my mouth and putting different kinds of things in. This is food and I have to swallow but I am so weak, this food is not going down too quickly. He is moving the food down into my crop with his fingers. The empty feeling in my crop is going away but it is so hard to swallow. I am breathing heavily. This is not easy. He is putting me in something. It is small but he is now leaving me alone. I will close my eyes and sleep again. There is less fear now. I think I am just too sick to care. I hope he leaves me alone now and lets me die. Ok, there are droppings beginning. They dont look too good but at least the system is working. Im going to give him another dose of antibiotic and water. He is so far gone it probably doesnt even matter. He will still have food in the crop in the morning so I wont have to feed him then. Ill just keep him on the antibiotics and hope for the best although I really dont think he will make it. That gasping when I fed him didnt bode too well. Hes pretty much right on that line between life and death. Poor little guy! I wish I had gotten him sooner. The pigeon is still alive. Droppings are still slow in coming and they still look lousy. Digestion is slow and as I suspected, there is still food in the crop. Although Im worried about food remaining in there so long because of the potential for sour crop, he is getting an antibiotic so it should be ok. Im just glad I didnt give him too much food last night. Eyes still show that he is feeling pretty sick but when I put my hand in to take him out and give the antibiotic, he did hiss a little and try to hit me with his wing, but hes still too weak to show much bravado. There isnt too much of a change although the droppings seem to be coming a bit more quickly. They still dont have much form and are not the right color. Green is not good. It could be excess bile or infection but one thing is for certain, this bird is not weak from starvation. This is illness. Theres no need to feed him because there is still food in the crop. He did growl at me and weakly hit me with his wing. There is a little more strength but its not much to rave about. Still, it seems to be heading in the right direction. There is some improvement in the form of the droppings and there is more substance to them. The crop is almost empty so I gave him a little more dog food. He is still to sick for regular seed. Who knows if he could digest that at all? Somehow I'm not dead yet.. The Man tried to touch me - I said NO with my wing and he seemed to back off. Why hasn't he hurt me yet? He just looks around. He dosen't have those pointed teeth that scare me so. Droppings are improving but only slightly. Whatever this is, its going to take quite a while to get out of his system. There is no need to add food to his crop. He is not as thirsty anymore. The bird is still very lethargic but he is sleeping less and droppings are continuing to improve although very, very slowly. I added some green peas and seeds to the dog food and we will see how he handles that. He growled and hit me with his wing just a little bit more strongly. Eyes still show that sick look but I he is standing on one leg and that shows that there is some more strength in him. I dont think I will ever know what kind of infection is in him. If there were blood in the droppings, it would be a salmonella (parathyphoid) but that isnt the case. I dont really care what this is as long as this bird continues heading in the right direction. The bird still looks too sick to care where he is. Something good is happening with the droppings and I didnt expect such a jump in progress so quickly. They are not with too much liquid anymore and are beginning to take on the right consistency and are larger. Their color is changing from green to a darker color and probably on the way towards the normal brown. Digestion is still very slow but obviously speeding up and Im not thrilled with that but digestion in the sick bird is slow. Im going to take a chance and put some grit down him to see if the process is speeded up a bit. The grit should aid in grinding down the food more quickly. When I put my hand in order to take him out for the grit, he gave me a lot of growls and hit me with his wing a few times. If he holds it, I think I will syringe down some water-soluble vitamins and some liquid Calcium Gluconate tonight. If he can hold that, it will start to build him back up. I syringed down vitamins and Calcium Gluconate and he seems to be handling that pretty well so he is going to get twice daily. At this rate, I dont think hell need antibiotics beyond day eight. Droppings look much more normal now. I increased the amount of seed and peas and reduced the dog food. His digestive system is handling normal food. They are beginning to turn slightly brown. This bird will make it. Except for the color, droppings look pretty normal. He isnt gasping anymore so the weakness is disappearing. This bird is plenty angry with me and is showing it. The situation has definitely turned around and he is improving. His eyes are more alert but there is still lethargy although I see signs of curiosity in him. Ill continue the antibiotics until Wednesday night and that will make it a full eight days. Ill also syringe down vitamins and Calcium Gluconate until Wednesday and then simply dissolve all of it in his water. Too much of a good thing is not so good. Everything is going very well. Droppings are perfectly normalized and the bird is no longer lethargic. As a matter of fact, he wants out of the cage badly. He keeps running back and forth. He knows where the door is and every time I open it, he tries to sneak past me to get out. He hates me and is throwing some pretty serious growling and wing slapping my way. He has an appetite and is eating on his own. Hes ready to go. There is nothing more I can do for him and still dont really know what this illness was. This bird has a second chance and I hope he lives a long time. Ill take him down and release him back to his flock. Then, Ill disinfect the cage, take some birdseed down to the flock and see whats doing. Im glad its Saturday because there is no work. I have such aggravation down there. The Man took me into the fresh air. It feels good and I feel good. He has opened the hand that is holding me. He has not hurt me but I dont understand everything that has happened. I know this place. Its home. I have to find my mate and the others. ...there was a small area that represented a little microcosm of the world. An overhead trestle constructed for one of the elevated train, runs formed that underpass. Beneath, is a set of supporting columns and horizontal formations that are created by the concrete beams. A street runs there and cars pass by throughout the day. There is an island separating the traffic merging into a single road. It was a natural roosting place for pigeons and a large flock once resided there. They made their nests on the horizontal beams and would come down to the island and the sidewalks to peck on the cement, looking for the pieces of grit they required for the mineral content their systems needed. Sometimes, a kindly person would drop some bread on the island and it was a welcome treat for a flock in a perpetual state of near starvation and malnourishment. This was a natural dumping area for those who felt it was an easy drop point for those items that were no longer needed. There were broken air conditioners, old tires, pieces of discarded cars and miscellaneous other types of garbage. The place reeked of automotive oil, rotting organic material. and was rat infested. Anyone caught dropping some food for those birds would get an argument by residents of the surrounding residential area. After all, these birds are dirty and give diseases to people. These well meaning folks would be on the receiving end of these arguments while all of the rotting garbage lining the area stood accumulating. Nobody ever realized that this unclean place was giving diseases to the pigeons. It was, of course, the pigeons that were giving diseases to people. Perhaps the energy spent in fighting good people would have been better spent in cleaning up the area but it's always easier to open up a mouth and complain about the birds than to do something more constructive. Baby pigeons become very excited when the parents come to feed them. Sometimes, they forget where they are walking and fall down onto the pavement. Their young wings are too weak to carry them back to the nest. When they come down, they are frightened and either run in different directions looking for a way up, thereby becoming lost or sit where they fall, waiting for the parent to come help. They usually died first. Small neighborhood kids usually found these babies and grabbed them by a wing, swinging them around and around until the flight feathers were ripped off and the elbow holding these feathers were shattered. When the fun was over, the hapless youngsters were left to their fate and it came in the form of a car running over them, a street cat or rodent looking for an easy meal. They were the lucky ones. These unfortunate birds smart enough to seek cover, died of trauma, starvation and thirst. Sometimes, a kid would pick up a rock and use the baby as target practice. A good idea was to jam the bird into the hole of a tree, step back and see how many rocks it would take to kill the it. Sometimes, if there was a book of matches available, one was lit and various parts of the body received the flame. These things have happened. They have been seen happening. One Rehabilitator took what was left of the birds and tried to bring them back. There are lots of ways to torture and then destroy life and it is easy. It's not as easy to save life. Once, a young bird first trying out its flying abilities came down on the barbed wire that was lining the top of a metal fence. The barbs penetrated his body and the more he struggled, the more injured he became. He died slowly, hanging upside down. This was one bird the rescuer didn't see. A young pigeon picking among the garbage, became entangled in some string. It wrapped around his foot and when he flew, the long strand of string would trail behind him. One day the pigeon landed on a tree branch and the string caught on some twigs. The youngster, weakened by a lack of food did not have the strength to break free of this trap and after he was totally exhausted from his attempts, sat on the branch until he died of starvation and thirst. He was seen hanging by the string from the tree after he died. Had the bird been stronger, he would have flown, ripping the leg from his body in order to escape from that situation. The chances are that if that happened, he would have died from loss of blood. Somebody would have had to have seen this bird and gotten a ladder to reach him in order to save his life. Nobody ever looked into the tree to seek anything like that and if by any chance, the hapless bird was spotted, who would have helped? The rescuer didn't see this bird until after he died. One doesn't forget losses. They stick in the mind and come back at night to haunt. Pigeons are very territorial. Where they live, they stay. Their instincts prevent them from moving somewhere else. The pigeon has a strong homing instinct and even though an injured or sick bird would be picked up and healed by a rehabilitator, it would fly back to that place, back to its home, back to hell. The rescuer went to that area every evening after work to feed the pigeons and pick up any bird that was injured or sick. He found a nightmare of illnesses that ranged from severe abscesses to salmonella cases that were the worst he had ever seen. Canker was rampant. It took a lot of work and a lot of time and a lot of effort to bring these birds back. He picked up more birds from that area than he had from any other before or since that time. The neighbors finally did something about that place. An exterminator was hired and a thorough job was done to kill off all of the birds and the garbage was removed. Driving through now, it is all been cleared. If one stops to look and listen, it is very quiet. There are substantially no birds there. The pigeon flock is gone. There are no new birds being born. The silence is no longer broken by their peeping sounds. There are no longer birds coming down to the people who dropped some bread for them. All the rescuer knows is that they are gone. Occasionally, a single pigeon can be spotted on the ground and who is to say that it was part of the original flock or simply a passerby? One also wonders how the kids who "played with the babies" will turn out but the people who raise them now have a pigeon-free area and that will be enough to keep them satisfied. After all, kids will be kids. However, they may grow up to become those who abuse their wives and children or continue to pillage our planet until there will be nothing left for the pigeons or for us but everybody is entitled to their share of what is left, aren't they? This isn't just about one area where pigeons no longer live. It's about the lack of respect most people have for our fellow travelers. It's about what we teach our children about the sanctity of life. It's about compassion. It's about how we are educating our children and it's about what is not being taught to them. It's about abusive parents and how they shape those who will take over after we are gone. This is the way it is for all pigeon flocks no matter where they are. This is how they try to survive in spite of all the dangers. These birds can teach us something about life and how to fight for it until the very end. They will hide their illnesses until they can't anymore. They stand until they can no longer stand. Then they lie down until the last breath leaves them. They are fighters and survive in spite of what we do to them and to their environment. When you hear somebody call a pigeon a "Rat with wings," think about it. Perhaps it is more important to consider who is saying it. The rescuer no longer visits that place anymore more nor does he want to..